We are no strangers to talking about Chrissy Teigen. She is highly relatable and also absolutely hilarious. However, she shines the most when she's both. 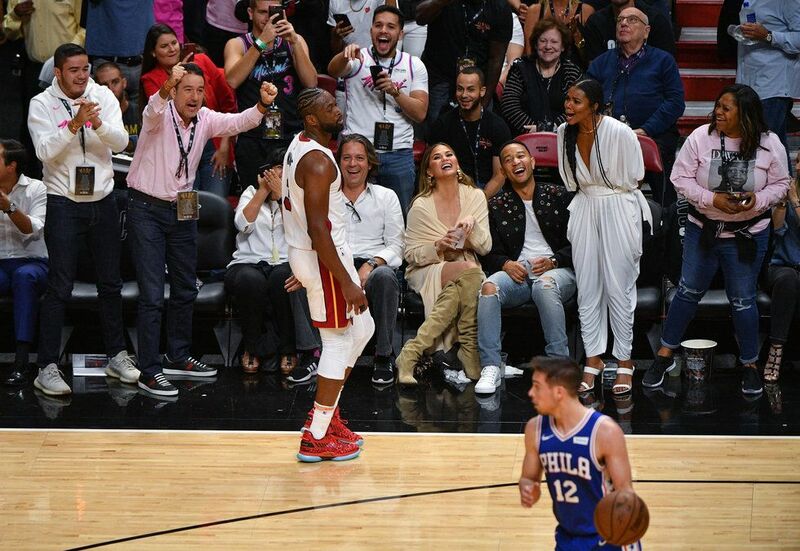 Teigen was with her husband, John Legend, to watch the Miami Heat in Florida. It was the final regular season home game for Dwayne Wade before he's set to retire. And he must have wanted to go out with a bang, because he took a dive into in the audience, ending up in Teigen's lap. I'm not a professional athlete, but I have a feeling you aren't supposed to do that. Lucky for Wade, Teigen was a good sport about the whole situation. It probably also helped that she was there with Gabrielle Union, famous actress and Wade's wife. It looked like she was ready to chew his ear off after he crashed into her friend. The internet also enjoyed the photo so much. It was caught at just the right moment, with Teigen and Legend reacting as most anyone would in the situation. However, Wade's expression is still so focused on the game. It creates the kind of dynamic you don't find in a normal photo. It's like a lightning strike. It's a work of art. Or as everyone else says, a renaissance painting. If you focus on any one portion of the moment of impact, you're bound to find something new. I personally enjoy the near perfect symmetry between Teigen and Legend as an athlete lands in their laps. Maybe you're the romantic type, and instead, I'll draw your eye to Wade's left arm, which is being cushioned by Union. She's obviously ready to catch her hubby. It's the kind of photo that could be studied for ages. But this is the internet, so let's just turn it into a meme. The photo is sure to be remembered in the annals of history as a moment of pure art. Either that, or it's going to be the reaction image people use for a day and a half and promptly forget about until someone makes a "Best of 2019" article. Whatever the case, it's great it can bring some joy to the internet. I just hope the next time Teigen makes the internet laugh, it's a little more on purpose.